Green tourmaline and baguette diamond ring. 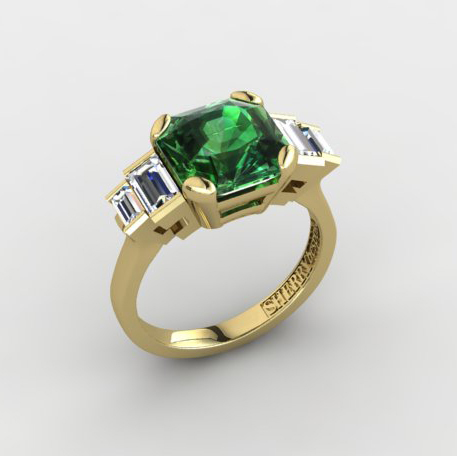 This superb asscher cut lagoon green tourmaline was designed for a lady that wanted a crisp and pristine looking design. She admired the linear qualities associated with 1930’s Art Deco. So we introduced these perfect baguette cut diamonds, in a stepped configuration. We kept all of the stones at a similar height. This gives the effect of a smooth, glazed panel of gems, rather than a staged decreasing height. The tourmaline is 4.3 cts, Asscher cut, from Mozambique and is entirely natural, having no heat or irradiation treatments.